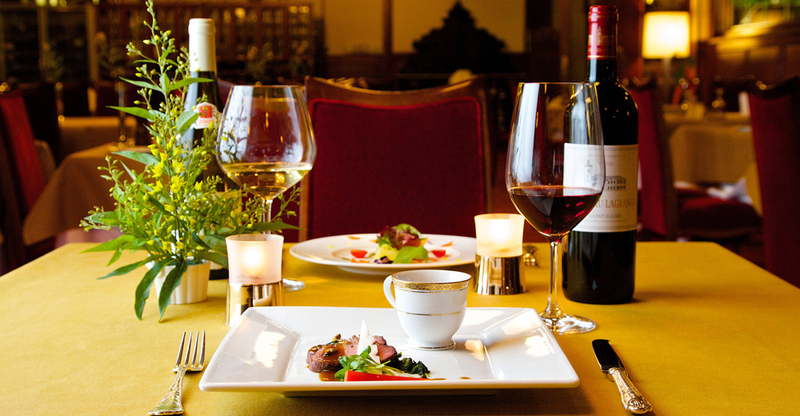 A choice of French, Chinese, and Japanese cuisine awaits guests at Mampei Hotel. Our chefs use only the freshest seasonal ingredients to prepare sophisticated meals that will be among the most memorable highlights of your stay. All of our dining venues are non-smoking. 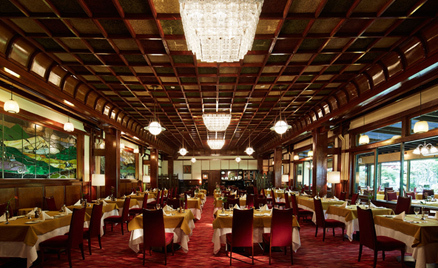 Located in the vintage 1936 Alps building, the hotel's flagship restaurant is an experience in itself. With a coffered ceiling and stained-glass wall panels depicting scenes of Karuizawa, its classical ambience perfectly complements the traditional French recipes featured here at lunch and dinner. Transcending the bounds of the traditional “Four Great Chinese Cuisines,” our Chinese restaurant presents a variety of dishes as authentic as they are delicious. In addition to the course and a la carte menus, the tantanmen noodles are not to be missed! 6 to 8 : 30 p.m.
A la carte selections are also offered. 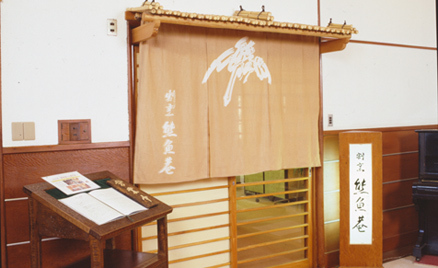 Kyoto's legendary Tankuma Kitamise operates two restaurants on the hotel premises. 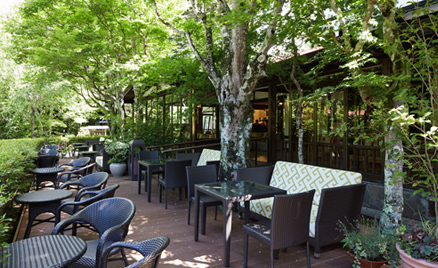 Enjoy sumptuous Kyo-kaiseki, the pinnacle of Japanese cuisine, in a two-story wooden house next to our main building. Marunabe Kaiseki is a multicourse feast that includes a flavorful tortoise-meat hot pot, a signature dish. The acrobatic performance of the teppanyaki chefs is another highlight. 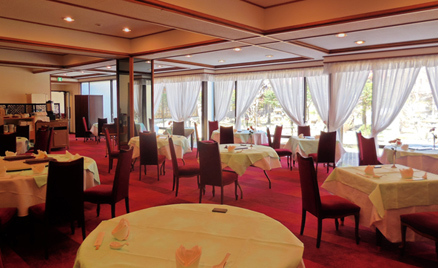 Tankuma offers multicourse meals, a la carte dishes, and other light Japanese fare in this venue conveniently located just off our main lobby. A hit with many repeat clientele is the Kuroge Wagyu Sukiyaki Gozen, Japan's premium beef simmered with tofu and vegetables in soy sauce and sugar. 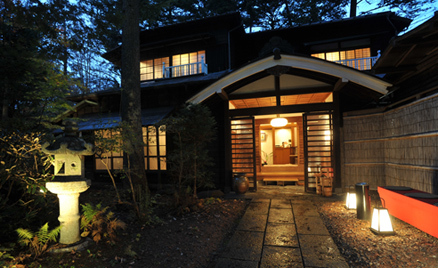 Both Japanese restaurants are closed for the winter season from late November. A favorite destination of locals and visitors alike, the café is known for its association with the John Lennon family. Topping the menu is royal milk tea, brewed with milk just as John himself liked it, and served with a slice of fresh Nagano apple pie. Other popular items include blueberry pie and pine-nut tart. The outdoor deck, open when the season permits, welcomes pets. The Mampei bar's elegantly old-fashioned atmosphere makes it a choice gathering place for Karuizawans as well as hotel guests. 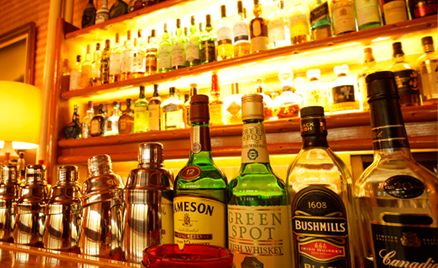 Starting with its broad selection of sought-after Japanese whiskies like Suntory's Hibiki, Yamazaki, and Hakushu labels, the bar prides itself on catering to patrons with discerning tastes.